Amazon Sumerian is a purely cloud-based tool. Its scenes are intended to be run directly from the cloud. As such, one of the most common questions is: how can I download the scene I created in Amazon Sumerian? You might want to do this to have a backup, to send it to a colleague or to move the scene to another region. The easiest way to backup your scene is to create a snapshot. This is directly integrated into the main Sumerian editor UI. Select the root node of the scene in the Entities panel. Next, navigate to the “Snapshots” section in the inspector panel. In this panel, you can create snapshots that are easy to return to later. I’d recommend creating a snapshot before major changes in your app, after finishing vital parts of code, and obviously for every publicly released version. However, the snapshots are internal to the scene. How to get content from one scene to another? Integrate the real world into your Amazon Sumerian AR app. Plus: place virtual content into the user’s environment. Learn how to anchor multiple 3D models that have a fixed spatial relationship. This article builds on the foundations of the AR project setup in part 1, as well as extending the host with speech & gestures in part 2. While Sumerian comes with a few ready-made assets, you will often need to add custom 3D models to your scene as well. Currently, Sumerian supports importing two common file types: .fbx (also used by Unity and Autodesk software) and .obj (very wide-spread and common format). Simply drag & drop such a model from your computer to your assets panel. Alternatively, you can also use the “Import Assets” button in the top bar and then use “Browse” to choose the file to upload. Where to get these 3D models? Either you create them yourself using Blender, Maya or any other tool. Alternatively, go to great free portals like Google Poly and Microsoft Remix 3D. These objects are usually low-poly and therefore well-suited for mobile phones. 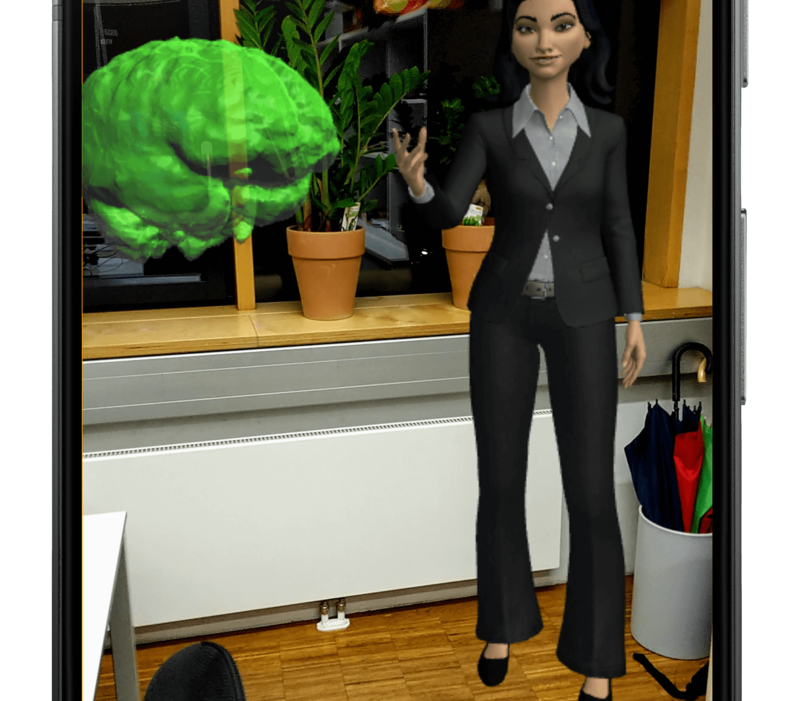 In the first part of the article series, we set up an Augmented Reality app with a host (= avatar). Now, we’ll dive deeper and integrate host interactions. To make the character more life-like, it should look at you. 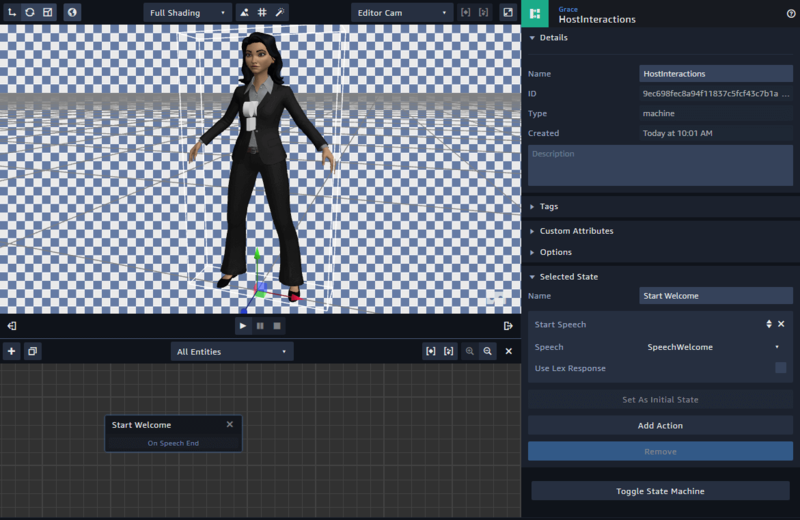 We’ll assign speech files and ensure that the gestures of the character match the spoken content. But before we set out on these tasks, let’s take a minute to look at some vital concepts of Amazon Sumerian. Unless you want your app to just show a static scene, you’ll need to integrate actions. The trigger for an action could react to interactive user inputs. Alternatively, you define what happens sequentially – e.g., first a new object appears in the scene, then the host avatar explains it. Technically, this is solved using a state machine. Each entity can have multiple different states. A behavior is a collection of these states. States transition from one to another based on actions & their events (= interactions or timing). Sumerian State Machines – Behaviors contain states, which have actions that can trigger events, which lead to transitions to other states. These actions can trigger events. Some examples: the wait time of 5 seconds is over, the movement is completed or the sound file finished playing. Using a transition, you can then transition to a different state. 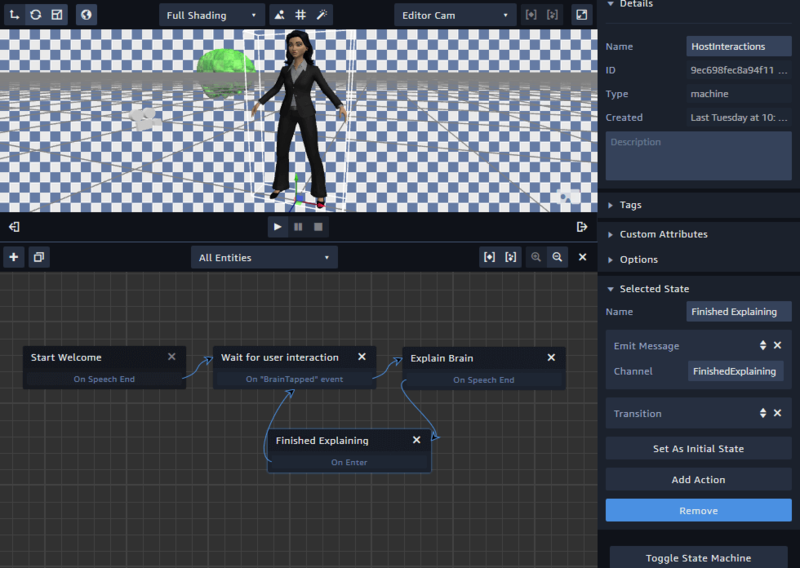 By combining several states together with transitions, you can make entities interact with the user or perform other tasks to ensure your scene is dynamic. Many AR / VR use cases involve virtual trainings or guide topics. With Amazon Sumerian, you can quickly create cross-platform apps for these scenarios. The main advantage is the large amount of ready-made content: avatars (called hosts) and virtual environment templates. Through the direct integration of Amazon Web Services (AWS), it’s easy to make the host speak to the user – including lip sync, gestures and even conversations through bots. Of course, you can create similar solutions with Unity. But Sumerian requires far less prior 3D software knowledge and is therefore ideal for smaller projects as well as prototypes. The interface and generic setup is still quite similar to Unity; so it’s a good evolution to switch to Unity – if needed – after you’ve created your first few apps and services with Amazon Sumerian. Additionally, right now Amazon is hosting an AR / VR challenge with lots of prizes for the best apps of various categories. So, it’s a great time to explore Sumerian! 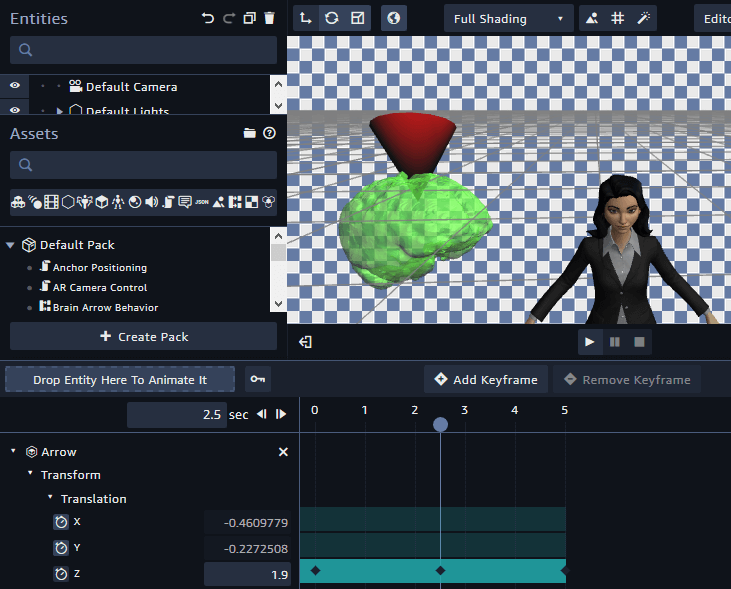 Essentially, Sumerian is a browser-based 3D editing platform. 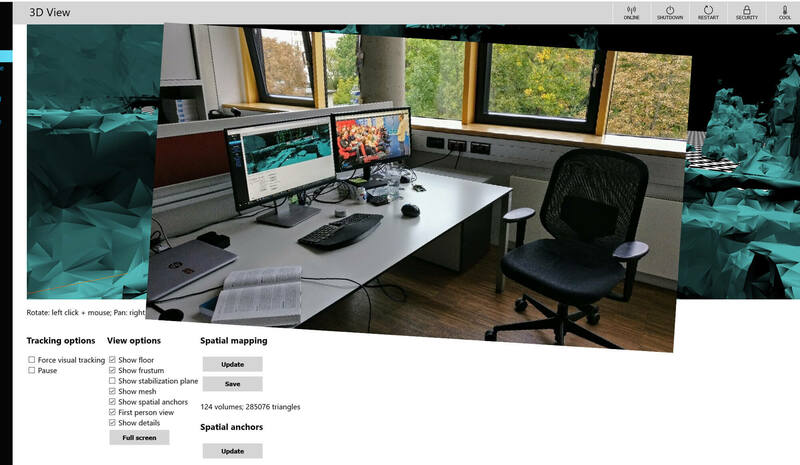 It allows developing for most AR and VR platforms, including Oculus, Vive, Windows Mixed Reality, as well as the browser, Google ARCore and Apple ARKit. Behind the scenes, it’s based on WebXR. That’s the evolution of WebVR, which was mainly targeting VR headsets. 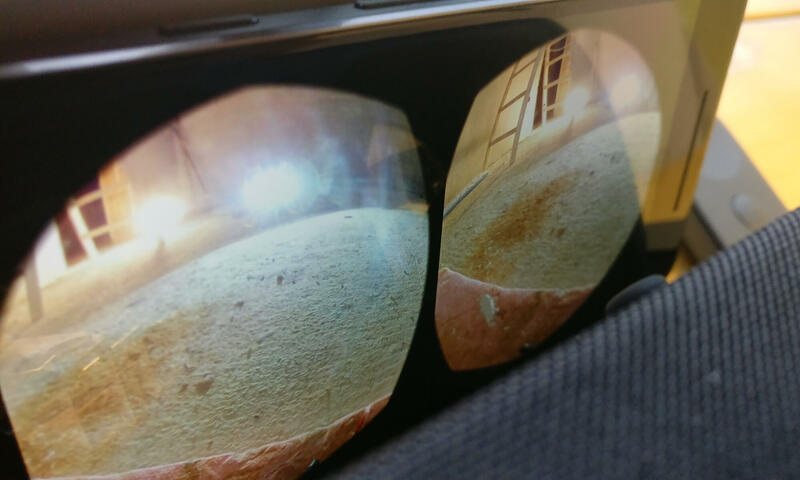 With WebXR, you can access sound, controllers and also anchor objects to the real environment in Mixed Reality scenarios. First, you need to set up your Amazon account. Amazon offers an AWS free tier, which gives you access to many services and provides some usage quotas for free for the first 12 months. Afterwards, you can still continue using selected services for free. Note that Sumerian is not part of these, but 12 months provides enough time to test & develop your service. Overall, the AR ecosystem is still small. Nevertheless, it’s fragmented. Google develops ARCore, Apple creates ARKit and Microsoft is working on the Mixed Reality Toolkit. Fortunately, Unity started unifying these APIs with the ARInterface. At Unite Austin, two of the Unity engineers introduced the new experimental ARInterface. In November 2017, they released it to the public via GitHub. It looks like this will be integrated into Unity 2018 – the new features of Unity 2018.1 include “AR Crossplatfom Kit (ARCore/ARKit API)“. The traditional mobile AR app development cycle includes compiling and deploying apps to a real device. That takes a long time and is tedious for quick testing iterations. A big advantage of ARKit so far has been the ARKit Unity Remote feature. The iPhone runs a simple “tracking” app. It transmits its captured live data to the PC. 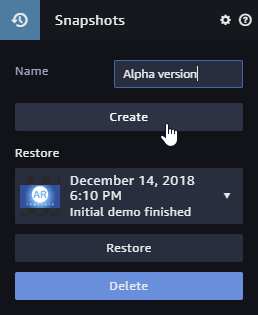 Your actual AR app is running directly in the Unity Editor on the PC, based on the data it gets from the device. Through this approach, you can run the app by simply pressing the Play-button in Unity, without native compilation. This is similar to the Holographic Emulation for the Microsoft HoloLens, which has been available for Unity for some time. 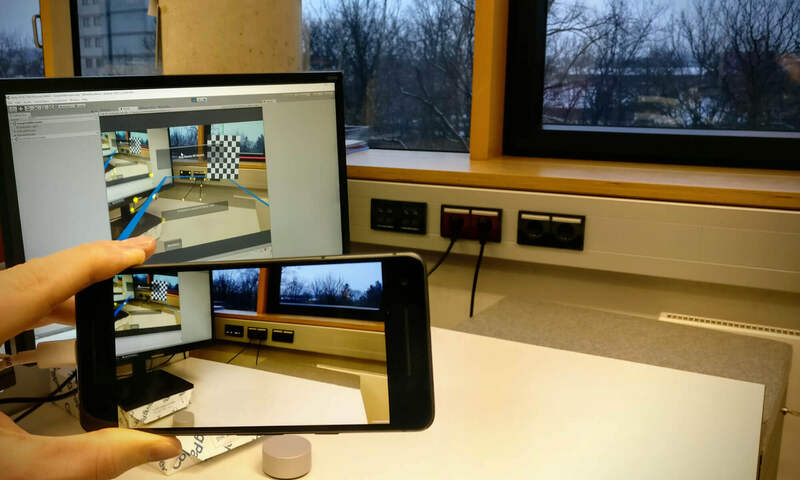 The great news is that the new Unity ARInterface finally adds a similar feature to Google ARCore: ARRemoteInterface. It’s available cross-platform for ARKit and ARCore.